Apr 4 Long live the Queen - Geovana Peres is the WBO World Champion. 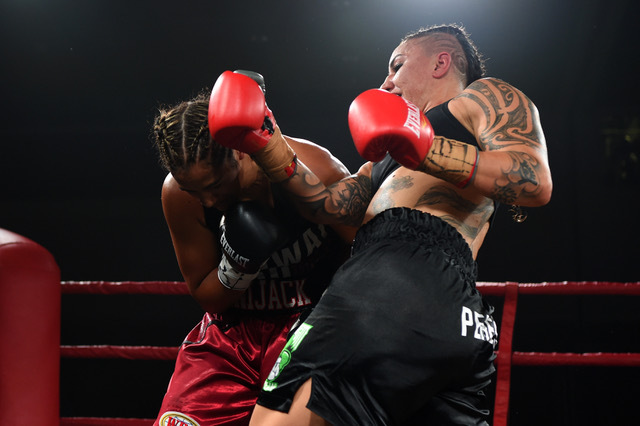 On Saturday night the eyes of the world turned to Auckland to see Lani Daniels and Geovana Peres meet once again inside the squared circle, but this wasn’t the ABA and they weren’t just fighting for a New Zealand title. This was the big show. The one we’ve all been waiting to see. The one these two athletes have been training their whole lives for. The WBO Women’s Light Heavyweight World Championship. And it didn’t disappoint. The Sky City Convention Centre was packed to the edges with tables full of punters for the biggest event ever produced by Bruce Glozier of Glozier Boxing. A night of fantastic fights saw Navosa “Smiley” Ioata grinning wildly after putting a stop to Thomas Russel with some thundering blows before Hemi Ahio took a convincing points decision against the veteran big man Julius Long. But the main event was something to behold indeed, with Ring Announcer Dan Hennessey describing at as the best boxing match he’d seen this decade. The first round opens with Peres coming forward and Daniels backing up on the ropes. Clearly the better defensive boxer of the two, Daniels is moving quickly to avoid the power of Peres but halfway through the first she’s already starting to get caught. Daniels is moving quick but Peres continues to land jabs to the face as she backs Daniels up again and again. Peres is warned for headbutts in the clinch before the round closes. The second round starts and Daniels is taking a long stance to create distance and defend but Peres takes her to the ropes and lands some hard shots. Daniels escape and takes the fight across to the opposite side of the ring before again being trapped against the ropes and eating some powerful shots from Peres. The two fighters make their way back into the centre of the ring and the referee stops the clock with Peres being warned for kidney shots. Round three opens with a much more aggressive Lani Daniels landing repeated shots to the head of Peres but Peres seems to be landing the heavier hands doing more damage with fewer blows. Daniels throws a flurry of shots at Peres’ head but Peres leans back and smiles showing she’s unharmed by the exchange. The two fighters wildly swing with both landing some good shots. Round four begins and it looks like neither fighter wants to defend anymore, leaning into each others blows. Halfway through the round and Peres looks like she’s expended too much energy in that early exchange and the hands start to slow down as Peres takes over and punishes Daniels’ head. Ten seconds to go and Daniels comes back to life to fight a strong end to the round. 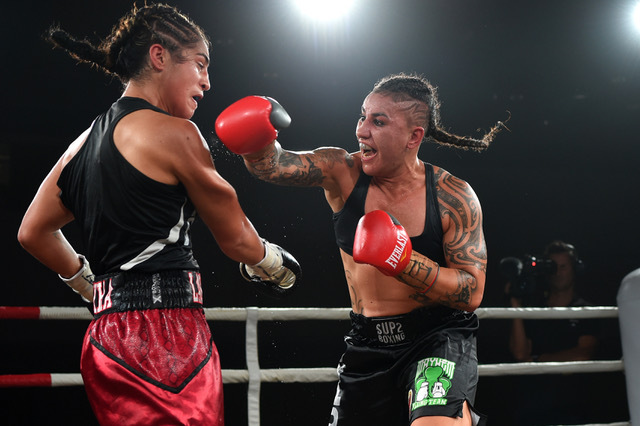 Round Five and Daniels has that energy back, as she lands some strong blows throughout the round and for the first time she seems to be controlling things. Peres lands a heavy haymaker to the face of Daniels but Daniels seems to come back from the blow well. Round Six and Peres and Daniels again meet in the centre of the ring, both fighters are looking to finish the night putting all of their bodies into a brutal exchange. Daniels lands a flurry of shots but Peres again dodges backwards and lands a heavy hook to the head of Daniels on the counter. Round seven and Daniels is the aggressor early on, Peres is trying to fight her way out with heavy blows but Daniels is now starting to control her opponent around the ring. The superior technique of Daniels is starting to overcome the raw power of Peres. Round 8 starts off at a much slower pace and now both fighters look to find range but it isn’t long before Lani comes forward with a strong shot and Peres leans in to try to do some damage. Both fighters throw with determination but it looks like Daniels might have the momentum now. The crowd chants “LaniJack”. Round 9 and Peres looks to regain control coming forward early and working around Lani’s head. Peres continues to punish Lani’s head but Lani’s defense looks impenetrable at this stage. It’s not clear if Peres has landed a single shot to the body of her opponent, though almost half an hour of power head shots must be starting to take their toll. The tenth and final round and both fighters look ready to leave it all in the ring, throwing with the rage of two women possessed from the moment the bell sounds. Lani keeps her guard high and defends well, finding the right moment to work the body of Peres. Both fighters throw wildly as the fight comes to a close. 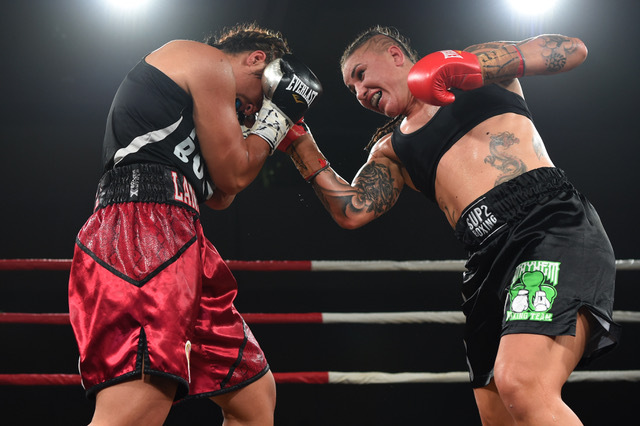 Lani Daniels has fought an amazing fight, but it’s clear that Peres used her size and power well to control most of this fight and as the scorecards are read out we know that the judges agree. Long live the new WBO Champion of the World, Geovana Peres. Mar 27 Tzinavos throws in the towel at Elite Muay Thai's "Domanation"